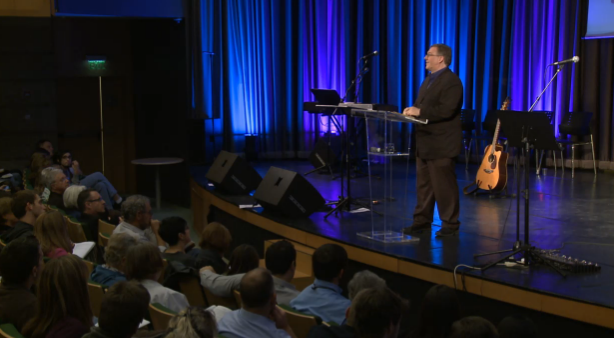 Watch all the messages from the 2012 Epicenter Conference now available on DVD. At the 2012 Epicenter Conference, I delivered a message on understanding the Scriptures concerning God’s love for Israel’s neighbors, & Israel’s responsibilities towards the Palestinians, as well as the Church’s responsibilities. In light of this week’s events, and the many sensitive issues that have arisen, I thought some of you might want to watch it. Here’s the link. At the same conference, we had a session of testimonies — a session in which an Israeli Jew, an American Jew, a Palestinian Arab, and a Jordanian Arab shared their spiritual journeys of how they came to faith in Jesus the Messiah, and how it changed them from the inside out. It’s a powerful video, and I commend it to you. Here’s the link. You can watch all the videos from our latest Epicenter Conference on DVD with family, friends, churches, small group Bible studies and home fellowship groups — click here for more details. UPDATED: On Thursday, 138 nations voted in the U.N. General Assembly (UNGA) to declare a “State of Palestine” and recognize it as a “non-member observer state” within the international community. Forty-one nations abstained from voting. Only nine nations voted against the resolution: the U.S., Israel, Canada, the Czech Republic, the Marshall Islands, Micronesia, Nauru, Palau and Panama. * “Speaking in Washington minutes after the vote, Secretary of State Hillary Rodham Clinton called the U.N. action ‘unfortunate and counterproductive,'” reported the Washington Post. “‘We have been clear that only through direct negotiations between the parties can the Palestinians and Israelis achieve the peace they both deserve: Two states for two peoples, with a sovereign, viable and independent Palestine living side by side in peace and security with a Jewish and democratic Israel,’ Clinton said.” It should be noted (admittedly to my surprise) that the Obama administration has had a stellar two weeks standing with Israel, first through the rocket war with Hamas, and now in voted against the Palestinian statehood resolution. Relations between President Obama and Israel have been rocky over the past four years, and may still grow rockier. But we need to acknowledge that the President and his team are doing well at the moment, and this should be commended. * Canadian Foreign Affairs Minister John Baird responded: “This resolution will not advance the cause of peace or spur a return to negotiations. Will the Palestinian people be better off as a result? No. On the contrary, this unilateral step will harden positions and raise unrealistic expectations while doing nothing to improve the lives of the Palestinian people.” I agree and I’m grateful to the government of Canada and specifically to Canadian Prime Minister Stephen Harper, who remains the most consistently pro-Israel leader on the planet in recent years. At the 2011 Epicenter Conference in Jerusalem, I delivered a full message on Joel chapter 3 and God’s warning to the nations not to divide His Land — to read my sermon notes or watch the video online, please click here. The Palestinians have suffered so much, from many sides. I wish a sovereign state was the answer. Nearly the whole world is convinced it is. But defying God’s Word won’t be bring blessing; it brings sadness and eventual judgment. Christians can — and must — love and bless and encourage the Palestinian people in general, and the followers of Jesus Christ in the West Bank and Gaza in particular. We can pray for them and visit them and invest in them and help them “do justice, and love mercy, and walk humbly with your God.” (Micah 6:8) We can be advocates of justice, mercy and compassion by the Israeli government towards the Palestinian people, and advocates of the same by the Palestinian government towards their own people. There are many ways we can be a blessing to the Palestinian people. But it simply will not be a blessing to them — or to any nation or people group around the world — to support dividing the Land of Israel in disobediance to God’s Word. For more of what I have written and said over the years regarding the painful struggle of the Palestinians and how Christians should respond, see here, and here, and here. You and I are passionate advocates of justice for Israel because of what the Bible teaches. We must also be passionate advocates of justice from Israel because of what the Bible teaches. This does not mean Israel should divide the Land. This does not mean Israel should ignore her real and serious security needs. But too often, Christians who love Israel are not aware of — or sufficiently concerned about and responsive to — the plight of the Palestinian people, and particularly the struggles of the Palestinian believers. Are some of the political, moral and historical charges of the Palestinians against Israel overblown? Yes. Is some of the rhetoric of the Palestinians against Israel, Jews and Christians who love Israel hyperbolic and unfair? Yes. But are the Palestinian people struggling in real and very painful ways? Yes – the truth is they are. And we should care because Jesus cared. Much of this struggle has been caused by the unwise and ungodly choices of their leaders….and their Arab and Islamic allies in the region….and by the terror groups in their midst. But is some of this pain sometime caused by – or exacerbated by — Israeli mistakes….excesses….and even sins? Unfortunately, the answer is yes. Again, this does not mean the Land should be divided…That does not mean a sovereign Palestinian state should be created….It does mean that followers of Jesus Christ should care about justice and mercy for the Jews and for the Palestinians, and for all of Israel’s neighbors who are suffering in this fallen world….After all, while the Bible clearly explains that the Lord will bring the Jewish people back to the Land of Israel and allow them to reclaim their God-given ownership of the Land, nowhere in the Bible are Jews (or any group of people) given a license to commit injustice. To the contrary, the Bible teaches Israel to love her neighbors (Leviticus 19:18 and Matthew 19:19). The Bible also teaches Israel to love her neighbors and pray for those who persecute them (Matthew 5:44). The Jewish people do have rights to the ownership of the Land, but they also have responsibilities to govern justly and compassionately, in accordance with the Scriptures. Those of us who are followers of Jesus Christ need to not just preach but also to practice sound Bible doctrine regarding Israel and the Palestinians….We need to love both….bless both….pray for both….We need to stand with and encourage our brothers and sisters in the Messiah whether they are Jewish or Arab….The Bible gives us no freedom to ignore, deny, or oppose our brothers and sisters on either side….Jesus said “blessed are the peacemakers for they shall be called sons of God” (Matthew 5:9). We need to be pro-actively building relationships with Israelis and Palestinians….we need to be faithful ambassadors of Christ….we need to be true agents of reconciliation whenever and wherever possible….We do not have to agree with everything that our brothers and sisters believe — especially if those beliefs are unscriptural — but we are commanded to love them unconditionally and sacrificially….We are commanded to see struggle and suffering and respond in love and compassion, whether it’s a Jewish person in pain or an Arab. Please continue to be praying for the Palestinian people — that God may show them His grace and favor and mercy in a real and special way, and that the Church will show them God’s love, too. These are precious people loved by our Lord and need so much better than they have gotten over the years. Please prayerfully consider helping The Joshua Fund care for the poor and needy in Israel, care for people affected by Operation Pillar of Defense, teach the Word of God in the epicenter, educate and mobilize Christians around the world to bless poor and needy Israelis, train pastors and ministry leaders in Egypt, strengthen the believers in Syria, and prepare for the next major war in the Middle East — would you make a generous, tax deductible financial contribution to The Joshua Fund? The Palestinians could have been celebrating the 65th anniversary of their state today. What happened? * 1947— Humanly speaking, the Palestinians could have been celebrating the 65th anniversary of their state today. After all, 65 years ago today, the U.N. voted on the “Partition Plan,” giving part of British Mandated “Palestine” to the Jews to create the state of Israel, and part to the Arabs to create a Palestinian/Jordanian state. The Jewish leaders said yes to the U.N. plan, and created Israel. The Arabs said no to the U.N. plan, and went to war to destroy the Jews. They lost the war and got heartache and poverty instead. * 1967 — The Arabs — led by Egypt and Syria — built up their military forces, surrounded Israel, and vowed to “throw the Jews into the sea.” But they not only lost the Six Day War, they lost control of Judea and Samaria (the West Bank), and the Golan Heights, and the city of Jerusalem. Israel offered to make a peace treaty. But the Arabs issued the famous “Three Noes” declaration at a summit in Khartoum: no peace with Israel, no recognition of Israel, no negotiations with Israel. * 2000 — Israeli Prime Minister Ehud Barak offered Yasser Arafat a sovereign Palestinian state in 2000 at Camp David, including all of Gaza, 90% of the West Bank, and half the Old City of Jerusalem. Arafat said no, and went home to unleash a wave of suicide bombings and other terrorists attacks against Israel known as the Second Intifada. * 2005 — Israeli Prime Minister Ariel Sharon withdrew all Israeli forces and people from Gaza and unilaterally gave the Palestinians Gaza without asking for a treaty in return. Yet the Palestinian leadership said no to making peace. Rather, the Palestinians began firing thousands of rocket and missile from Gaza at Israeli civilians. * 2008 — Israeli Prime Minister Ehud Olmert offered the Palestinians a sovereign state, yet again the Palestinian leadership said no. * 2009 — Israeli Prime Minister Benjamin Netanyahu came out in support of a Palestinian state (with some caveats). Yet the Palestinian leadership refused even to sit down for direct negotiations with Netanyahu and his government. A state with no control over its territory — The Palestinian Authority has zero authority in Gaza today. Out of concern for his personal safety, President Abbas has not even seen this area with binoculars since 2007, when the Hamas terrorist organization seized control of it in a bloody coup. Demonstrating their affection for Mr. Abbas, Hamas threw members of his political party off 12-story rooftops. While members of the U.S. Congress visit their constituents on a weekly basis, President Abbas hasn’t laid eyes on almost half of the Palestinian population for six years. A terrorist state — States recognized by the U.N. must pledge to be “peace-loving.” This month, Hamas showed its commitment to peace and love in Gaza by firing more than 1,200 rockets into Israeli cities. An undemocratic state — Hamas has imposed brutal tyranny in Gaza, and Palestinian democracy in the West Bank is also far from Jeffersonian. 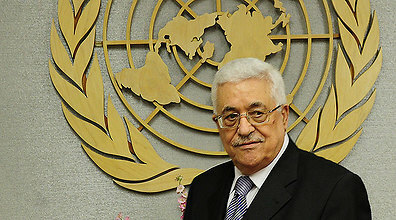 President Abbas’s mandate to rule expired three years ago. He continues to personally extend it without elections or consultation from his people. A bankrupt state — Palestinian Authority institutions remain completely dependent on foreign aid, limping from crisis to crisis. Yet this year, as the PA threatened to delay payroll for many employees, it tripled payments to convicted terrorists. Today the PA devotes 6% of its annual budget to payments for imprisoned terrorists and the families of suicide bombers, and less than 1% to higher education. As I stated at the beginning of this column, I am sympathetic with the plight of the Palestinian people. They are loved by God, but so poorly led. That said, should the world support a sovereign Palestinians state under current circumstances? Should Christians around the world support a Palestinian state at all? As I explained in detail yesterday, and have written numerous times before, I believe the answer is no. The Bible says God will judge all nations who divide the Land of Israel. Our love for Palestinians cannot turn a blind eye to such Biblical warnings. But we should support autonomy for the Palestinian people. And as Christians, we should support and encourage the Christian community in the West Bank and Gaza, and do what the Lord allows us to do to build up the Church among the Palestinian people. We should help them love their neighbors, study the Word of God, share the Gospel, make disciples, train pastors, and plant new Bible-teaching congregations. We should also help them stand for justice and stand against injustice of all kinds. Please be praying for the Palestinian people today — that God may show them His grace and favor and mercy in a real and special way, and that the Church will show them God’s love, too. These are precious people loved by our Lord and need so much better than they have gotten over the years. Should Christians support the creation of a sovereign Palestinian state? The UN is essentially set to vote for one on Thursday. >> Should Christians visit Israel to bless Israelis and Palestinians in the aftermath of the recent Gaza war? (Los Angeles, California) — Should Christians support the creation of a sovereign Palestinian state? This has long been an important question. But it’s particularly relevant this week. The U.S. and Germany are among a handful of nations that have said they oppose this resolution. The reason they oppose this resolution is not because they oppose the creation of a sovereign Palestinian state. To the contrary, I’m not aware of any government in the world that is opposed to dividing the Land of Israel and creating a sovereign Palestinian state. The reason the U.S., Germany and others oppose this resolution is because it is essentially a unilateral move by the Palestinian leadership to achieve a state without directly negotiating with the State of Israel. The Oslo Accords — which were signed back in the ’90s by Israel and the Palestinians — forbade unilateral moves by either side. Thus, the Palestinian leadership is now trying to break the one major diplomatic agreement it has ever signed with Israel. That doesn’t bode well for future peace talks. In the end, the creation of any new internationally-recognized sovereign state in the world requires an affirmative vote by the U.N. Security Council, not the General Assembly. The U.S. continues to vow to veto any resolution of this kind that might come before the Security Council unless it is the result of a comprehensive peace treaty agreed to in advance by the Israelis and the Palestinian leadership. The Bible doesn’t speak precisely to the issue of whether a sovereign Palestinian state will be created or not. That said, I tend to believe the geopolitical and prophetic evidence suggests there will probably be a Palestinian state in the not-too-distant future. International pressure on Israel to cut a deal, divide the Land, and create a Palestinian state is overwhelming, relentless, and intensifying. Currently, the Palestinian leadership refuses to negotiate directly with Israel. Rather, they hope to unilaterally declare a state by getting the vast majority of countries at the U.N. to vote for the creation of state at the General Assembly session in New York. The Palestinians have more than enough votes to pass such a U.N. resolution in the General Assembly (though, again, the U.S. has suggested it would veto a unilateral declaration if it came to the Security Council). The most intense international pressure for a Palestinian state is coming from Western Europe, which has grown increasingly anti-Israel and increasingly anti-Semitic. A majority of Israelis have become exhausted with the Arab-Israeli conflict and now would support a Palestinian state under certain conditions. Even Prime Minister Benjamin Netanyahu — the leader of the center-right Likud Party (which has historically opposed creating a Palestinian state) — has offered to divide the Land and help create a Palestinian state, so long as it is demilitarized and doesn’t divide Jerusalem. Despite this warning, the nations have repeatedly divided the Land of Israel over the centuries. Bible prophecy suggests the Land will be divided again in the last days. The Hebrew prophet wrote in Daniel 9:26-27 that in the last days “the prince who is to come” (the Antichrist) “will make a firm covenant” (a peace treaty) “with the many” (neighbors of Israel) for seven years, but will then break that treaty after three and a half years. This strongly — though not definitively — suggests a state will be created or reaffirmed through this treaty. On the basis of these and other Scriptures, I suspect a sovereign Palestinian state will be created, though it would likely be temporary in duration. The outlines of a geopolitical deal are already done. Israeli and Palestinian officials have been negotiating on and off for decades. So we should expect European pressure to continue to build and eventually a European leader will take the lead and get a deal done — to many, it will look like a wonderful peace deal, at first, but the Bible makes clear it will turn disastrous for Israel, and the Palestinians, and the world. In light of the Scriptures, I do not support the creation of a sovereign Palestinian state (one that can build an army, air force and navy; one that can make treaties with enemies of Israel; one that can threaten the very existence of the State of Israel) because I believe this would violate the Biblical admonition not to divide to the Land. Indeed, Christians must clearly and firmly warn the nations not to divide the Land in disobedience to the Word of God because it will lead to divine and terrible judgment. That said, I do support Palestinian autonomy. That is, I fully support the right of Palestinians to run their daily lives and their local governments, including administration of local law enforcement, education, utilities, communications, transportation, taxes, etc. I believe Israel should always work on doing a better job of treating Arabs with love, compassion and justice, according to the Scriptures. What’s more, I believe the Church should do a much better job loving and caring for Israeli Arabs and Palestinian Arabs, and sharing with them the glorious gospel of Jesus Christ that they might find forgiveness for their sins, peace in their hearts, hope for their future, and salvation for their souls (John 3:16). We should be encouraging the local Palestinian church, strengthening them and helping them be bold and courageous in living out the Word of God and preaching the Word in season and out of season. Jesus modeled love for the Jewish people (Matthew 15:32, Mark 6:34, Mark 8:1-3, Luke 10:3-9, Luke 23:34), and their neighbors (Matthew 19:19, Luke 10:27-37), and their enemies (Matthew 5:43-44) and told His followers to do the same. Let us continue to pray for the Prince of Peace — Jesus the Messiah — to draw more and more people in the epicenter to Himself. This is the only true and lasting hope for peace. Should Christians visit Israel in the aftermath of the 2012 Gaza war? Absolutely. Here are 3 reasons why. Absolutely — now more than ever. In fact, The Joshua Fund and I are moving full steam ahead on organizing the 2013 “Prayer & Vision Tour” of Israel, which will include the 2013 Epicenter Conference. Sixty people are already signed up for the trip — and we had 10 people sign up last week during the peak of the fighting. That’s what I love: believerrs who are willing to stand up and serve the Lord and bless Israel and her neighbors in the name of Jesus, even in hard times. 1. WE’RE LOOKING FOR PRAYER WARRIORS — The Lord commands us to pray for the peace of Jerusalem and we’re looking for people ready, willing and able to obey Him. On the tour and during the Epicenter Conference, we’re going to pray with and for Israelis and Palestinians, Jews and Muslims. We’re going to pray with and for local believers and encourage them in the faith. We’re going to help you understand the history of the epicenter, current events in the epicenter, and Bible prophecies about the future of the epicenter. The more you understand what’s happening in Israel, the better you’ll be able to pray effectively. Are you a prayer warrior? Would you like to be? This is the trip for you. 2. WE WANT TO HELP YOU SHOW GOD’S LOVE TO ISRAEL IN A REAL AND PRACTICAL WAY — Much of the world ignores or criticizes or isolates or condemns the State of Israel. That’s why it’s vitally important that followers of Jesus Christ take the opposite approach. Let’s show the love of the Lord for both Jews and Arabs by touring Israel and serving the people there. If you come on The Joshua Fund tour, you’ll see how we do humanitarian relief in this country to care for the poor and needy. You’ll visit our warehouse and meet our allies in the Land. You’ll also have the opportunity to participate personally in a humanitarian relief project that we’ll organize. It’s one thing just to visit the Holy Land. It’s quite another to actually make a difference here, to be able to roll up your sleeves and show God’s love to someone in need in a real and practical way. Very few tours allow you to do this. But we think it’s so important to help you step into the story and be a participant, not a spectator. Our team wouldn’t invite you to come to Israel if we weren’t committed to being there ourselves. As you know, my Joshua Fund colleagues just spent 12 days in Israel and the West Bank. By God’s grace, we helped with humanitarian relief work. We comforted those who were suffering. We held conferences for pastors and their wives, teaching through the book of Titus on godly leadership in challenging times. We encouraged local believers. We met with government officials. And we spent a lot of time in prayer. Some people told us we were crazy to go. But honestly, we would have been crazy not to. After praying about before we left, we knew the Lord wanted us to be there, and we were honored to obey Him. Is the Lord telling you to join us in 2013? Have you asked Him? Have you faithfully sought Him in prayer? If the Lord gives you the “green light,” please join us. You can click here for more details. We’re already praying for all the people the Lord will choose to bring on this trip that the Lord would do a great and mighty work in their heart, and in the hearts of their families and friends. I hope you’re among them. My colleagues and I are looking forward to meeting you. A look at the 2012 Gaza War, by the numbers: How many rockets were fired? intercepted? deaths? injuries? We have much to be thankful for: the 2012 Gaza war is over. The fighting has stopped. Please be praying for Israelis and Palestinians as they begin the process of recovering physically, emotionally, financially and most important spiritually from all that has happened during eight days of war. Israel was on the receiving end of a total of 1,506 rockets that were fired from Gaza during Operation Pillar of Defense. Cease-fire agreements announced between Israel and Iran-backed Palestinian factions in Gaza: Will it hold? (Washington, D.C.) — On the eighth day of “Operation Pillar of Defense,” Israeli Prime Minister Benjamin Netanyahu has announced a cease fire agreement with all Palestinian factions in Gaza, a deal that has been mediated by Egypt. The cease fire formally went into effect at 9pm local time (2pm eastern). The announcement came towards the end of very intense day of fighting on both sides, including a bus bombing in Tel Aviv that wounded 28 Israelis. A few hours ago I landed back in Washington, D.C. after twelve days in Israel and the West Bank. I’ve seen first-hand how painful this war has been for Jews and Arabs. Like many of you, I’ve been praying non-stop for the Lord to restore calm and security on the Israel-Gaza border and stop the fighting. Believers are commanded in Psalm 122:6 to “pray for the peace of Jerusalem.” The Lord Jesus Christ said in Matthew chapter 5, “Blessed are the peacemakers.” Thus, I want to believe that the cease fire will work and that the lives of both Israelis and Palestinians can slowly but surely return to normal. But I’m asking the same question everyone in the region is: Will the agreement hold? Following is the verbatim English text of the ceasefire agreement between Israel and the Palestinians in Gaza that was reached on Wednesday with Egyptian mediation. Please prayerfully consider helping The Joshua Fund care for the poor and needy in Israel, teach the Word of God in the epicenter, educate and mobilize Christians around the world to bless poor and needy Israelis, train pastors and ministry leaders in Egypt, strengthen the believers in Syria, and assist with those being affected by this new war in southern Israel — would you make a generous, tax deductible financial contribution to The Joshua Fund? 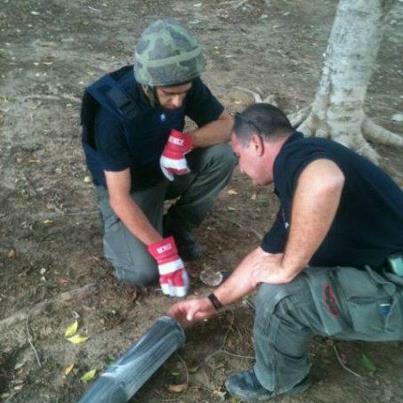 Israeli police from the bomb disposal unit inspect an undetonated warhead of the rocket that landed near us in Ashkelon today. Today, I decided to Tweet (@joelcrosenberg) moment by moment on a visit to the Israeli city of Ashkelon, not far from the Gaza border. I thought it was going to be an interesting visit. I didn’t know the half of it. It’s one thing to watch on TV as rockets are being fired from Gaza into Israel, and to watch the Iron Dome system fire missiles to intercept them. It’s quite another thing to be there in person and hear the air raid sirens going off, and run for cover to the nearest bomb shelter, and see the contrails of the rockets and missiles screeching across the sky, and then hear the earth-shaking booms, and to feel your heart pounding in your chest as you thank God that He protected you. May you never have to experience this. As I headed to Ashkelon from Jerusalem, I was accompanied by several of my colleagues with The Joshua Fund. We had been invited by a dear friend to come back to visit a hospital that serves as the primary medical center serving some 500,000 Israeli citizens who live on the southern tier. For the past several years, The Joshua Fund has been honored to invest in the purchase of much-needed medical equipment for the hospital through the generous donations of evangelical Christians in the U.S. and Canada. We knew that Ashkelon had been targeted for the past six days with a relentless barrage of rockets and missiles. We knew it was risky. But we also felt the Lord was telling to go and see how the staff was doing, encourage them, pray with and for them, and try to get a better understanding of what they and the residents of Ashkelon face. I’m so glad went. For awhile we thought we were going to be able to depart without incident, and that was what we were praying for. But Lord had other plans. Today, some 120 rockets were fired at southern Israel and 30 rockets were intercepted by Iron Dome. There is plenty of talk of a cease fire, but no evidence of one happening yet. Heading into Ashkelon w/colleagues from #TheJoshuaFund to visit Barzilai Hospital staff in the epicenter of the missile zone. Pls pray for us. Touring Barzilai Hospital w/#TheJoshuaFund team. No rockets, no sirens since we’ve been here, by God’s grace. Meeting w/Lea Malul, director of public affairs for Barzilai Hospital in Ashkelon. The Joshua Fund loves this hospital. Sirens going off right now! Just saw rockets incoming as we ran to shelter — and saw Iron Dome take them out. Thank the Lord for His protection. Psalm 91. We’re on the street where a rocket landed, but didn’t explode. More sirens right now. Israelis running for cover. At least 2 booms, Iron Dome intercepting. Now 2 more booms. Thank you, Lord for safety. Our Joshua Fund team is now leaving Ashkelon. We’ve met and listened to people who live here and described to us what their lives are like. Reading Psalm 91, grateful for the Lord’s grace & mercy. Praying for the millions in this area traumatized by the rockets & missiles. #Ashkelon. While I never felt scared (I certainly felt a surge of adrenaline, but also what the Bible calls “the peace that passes all understanding”), I certainly could better appreciate how difficult it must be to live a normal life when sirens keep going off and you never quite know where the rocket is coming from, or where it will hit, and how much time you have to get to safety. These Hamas rockets and missiles are weapons of terror. They are designed to kill and wound if they can, but also to instill fear and anxiety. I was impressed with all the Israelis I saw who could bounce back very quickly from each attack with a calm determination to get right back to their business. But I also met people who were deeply shaken by the relentless attacks and were having a much harder time than their neighbors. Please keep praying for the millions on both sides of this border — Israelis and Palestinians — who are living inside the missile zone. What is the Church’s role amidst times of evil and darkness? What are we as followers of Jesus Christ uniquely called to be and to do that no one else can? (Jerusalem, Israel) — For the past ten days, several of my Joshua Fund colleagues have been in Israel to teach at two events. The first was a conference for about 200 Israeli pastors and their wives that was held in Netanya. The other was for about 50 Palestinian pastors and their wives on the West Bank. In both places, the pastors we brought from the U.S. and Europe and I taught through the book of Titus, verse by verse and chapter by chapter. It was a wonderful time to be together with both groups, praying with them, learning from them about the challenges and stresses and joys they experience shepherding the congregations the Lord has given them responsibility for, and sharing with them lessons from the Scriptures about leadership lessons from the Apostle Paul, and the importance of establishing and maintaining sound doctrine and the careful preaching of God’s Word. On Sunday, one of those pastors who attended the Netanya conference — my friend Wayne Hilsden, pastor of King of Kings Community congregation in Jerusalem — invited me to preach at his evening service. It was a joy and an honor to do so. I will admit that I was torn on what to speak about, the crisis in Gaza and its prophetic implications, or insights from Paul’s letter to Titus. Both were very much on my heart. In the end I concluded that while the Lord wanted me to make a few comments and observations about Operation Pillar of Defense, the main message He had brought me to Israel to teach was from the epistle to Titus. Here is a link to the video of the entire worship service. The music was so wonderful, and I’d encourage you to enjoy all of it. Wayne’s introduction of me begins around 57:50 into the program, and I begin preaching shortly thereafter. I hope you find these words of encouragement — good news amidst so much bad news.